Today’s Favorite Things Friday is actually a three-fer. 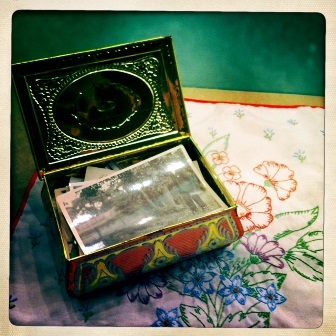 Old photos, old notes, and old tins. 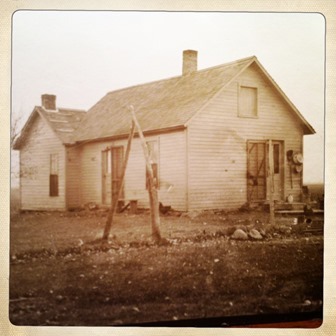 My real topic is vintage photos, specifically, this one of a Midwestern homestead with a funny note on the back. I love looking at old pictures: imagining the drama behind the moment captured in the photo, wondering what happened just before or after the photo was snapped, wondering where the subjects are now, imagining how the photo landed in my possession and pondering whether anybody misses it. I’m drawn to old photos at estate or thrift sales. I can’t help but look at them and feel a little sad about somebody’s memories ending up in a dusty bin to be pawed over by strangers. Sometimes I make more positive assumptions…I think to myself that maybe these are somebody’s outtakes after whittling down a collection, that there are better versions of the same scenes lovingly framed or scrapbooked somewhere. I sometimes find photos (or notes) tucked into used books that I buy. These are often my favorites, because someone saved that particular photo for a reason and I try to puzzle out what that might be. I use my collected photos for inspiration and meditation. A snapshot can be a starting point for a story or an endpoint, or it might simply help to give characters shape and definition in my mind’s eye. But I don’t mean to imply that all the old photos I have serve some function. Many I keep just because I love them and can’t bear to imagine them untethered in the universe. I try to be a good custodian and find good homes for them at my place or with friends who have similar sensibilities. 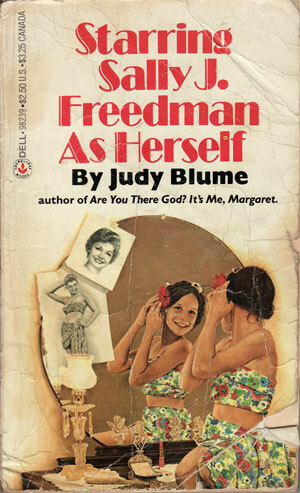 I keep my favorite photos in a tin, tucked into books, pinned on my bulletin board, or taped onto mirrors like Sally Jane Freedman did on my favorite cover of that Judy Blume book. There are many awesome photos in my tin, but the one I’m calling your attention to today is especially great because of the text on the back (other people’s correspondence is another one of my favorite things). Well Jennie here is our residents barn & corn crib on our farm, isn’t the house comical. The pin Lillian swallowed must of come thru allright. Dr. said it should of come the third day. Sophie watched her stool but Dr. said she should have strained it to be sure of finding it. Sophie didn’t do that. She seems just like always, just loves to tease Marion. Fred, Ma & I are going out to Schnorrs this P.M. His funeral is tomorrow at M.E. in Perry, isn’t it too bad. Isn’t that ridiculously fantastic? After I paid for the picture, I read it aloud and I could see the shopkeeper thinking he should have charged more or kept it for himself. Too bad! I’m attracted to old photos for all kinds of reasons: interesting architecture, vintage merchandising/shops, fun clothes, compelling facial expressions, favorite scenes. I love pictures of people reading, people with pets, and children with beloved grownups. I also love photos that happen to have vintage items that I own shown in their original era. Sometimes the note on the back is more compelling than the photo itself, but today’s photo and note are so much nicer together. What made the house comical? How can a photo be so…deadpan? What did Lillian look like? Did she really pass the pin? So many mysteries to contemplate. 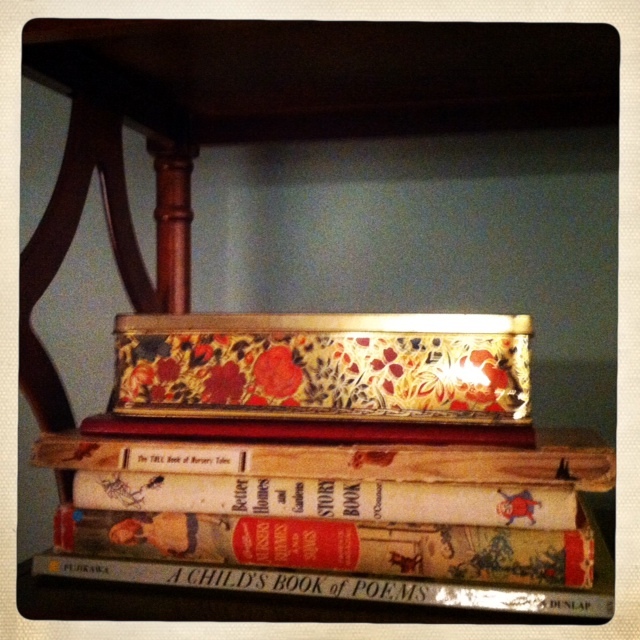 PS: This post features another favorite: old tins. I have a lot of them. I will save them for another post. But know that they hold many treasures. PPS: These pictures include three other favorites. Those who know me well, what are they? 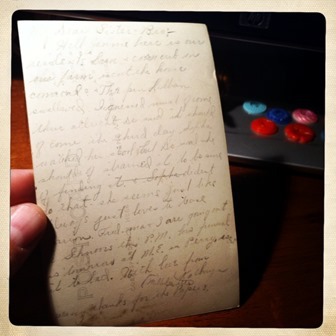 This entry was posted in Favorite Things Friday, Funstuff, The Writing Life and tagged correspondence, Judy Blume, notes, tins, treasures, vintage photos. Bookmark the permalink. I wouldn’t have sifted either. Ahahaha! Love your thoughts as the storekeeper listened to you read the backside of your new found treasure. Lori, I am embarrassed at how pleased I was with that outcome. Okay, maybe not. But I probably should be. Lovely. I once found a leather bound photo album in a dumpster in a Minnesota state park. I could not believe anyone would throw such a thing away. It was from the 1910’s-30’s and was filled with amazing pictures of well-to-do people out on picnics with their victrolas and their lovely baskets and awesome cars and servants! Of course, I kept the album. I made up stories about all the people and how we were related. Especially the man who was a spitting image for Uncle Fester. I still can’t believe someone left it there. It was a bit of fate that I found it. btw. I am guessing one of the things you love from those other images is the embroidered dish towel? Andrea, more evidence we are kindred spirits. I also have a leather bound old photo album with studio portraits, though no Victrolas or picnics or servants! I’ll show you mine if you show me yours! Also, you came closest to favorite thing #3: it’s an embroidered piece of cotton that I trimmed and use as a kind of doily. What’s the name for a doily that isn’t lacy or crocheted? That’s what it is. True thing!!! It will be great to finally meet in May! I don’t think it would be a doily if it is not crocheted or tatted or knitted. Don’t know what you would call it except AWESOME. Oooh! ooh! Mr. Kotter. 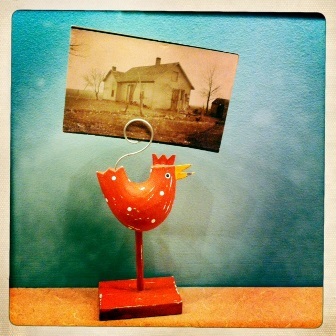 The three ‘other’ favorites in the photos might be: Vintage books, vintage fabric and birds?? Okay–I didn’t see the old buttons behind the letter. I change my answer! One of the things you love is old buttons.